After five years without a 3D-art facility, Utah State University Eastern is bringing back to campus ceramics and sculpture courses in the new state-of-the-art Central Instructional Building’s Fine Arts Wing. Experience as both a student and instructor fill Kanyusik’s resume as he studied art in Montana, Massachusetts, New York and California before beginning teaching in California for the next decade. He earned his bachelor’s degree at the University of Montana in ceramics and spent a year in Boston working in a post baccalaureate program in sculpture from Brandeis University. 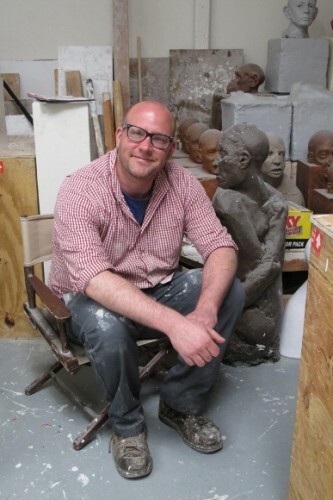 He attended graduate school in Rochester, N.Y., earning a masters of fine arts in ceramic sculpture from the Rochester Institute of Technology before returning home to Minnesota to become part of an art coop and teach 3D design at Minnesota State University. The Cleveland Institute of Art in Cleveland, Ohio, was his next stop. He landed a technical assistant position doing all the behind the scenes work for its ceramics department, which helped him get a teaching position in a higher education institution. After a year in the Midwest, Kanyusik went after his dreams of living in the West and bought three airplane tickets: to San Francisco, to Portland and to Seattle. He told himself that he would live in the first place he found with a good studio … that’s where he would live out his dream job as an artist and teacher. He taught adjunct classes at four to five community colleges each week to continue to get to do what he liked to do and live in a place he liked to live in. The only problem was some of the colleges he taugh- were 40 miles apart so he spent a great deal of time commuting in traffic. He also completed contract work to help pay the bills. The commission work he remembers best is making a cast of a dog sculpture for a dog-show trophy and “expensive evidence for a court trial” he couldn’t discus. His dream job has always been working at a university full time in the West, teaching ceramics and sculpture. His parents knew their son wanted to get a full-time position teaching art. “I know this sounds like a cliché, but I love it here. I have no complaints. Jobs like this do not happen in this field often and I am really lucky to be here,” he said. Besides beginning and advanced ceramics classes, he teaches three-dimensional design, sculpture (plane, relief, contour lines, metal, wood, clay, plaster carving and casting). He has a welding and wood working lab set up for advanced students. He also has an electric kiln, gas kiln, raku kiln and 16-pottery wheels to throw on. “The facilities are awesome and the classes are fun. I hope to make an increased presence on campus with my student’s work. I am especially excited to see student’s working and what they are creating,” he said. His work can be seen on chriskanyusik.com.